Café Coffee Day’s parent Coffee Day Enterprises Limited (CDEL) has filed draft red herring prospectus (DRHP) with market regulator for its IPO. Expectations are quite high from the IPO given that Café Coffee Day – popularly abbreviated as CCD – is a household name now. 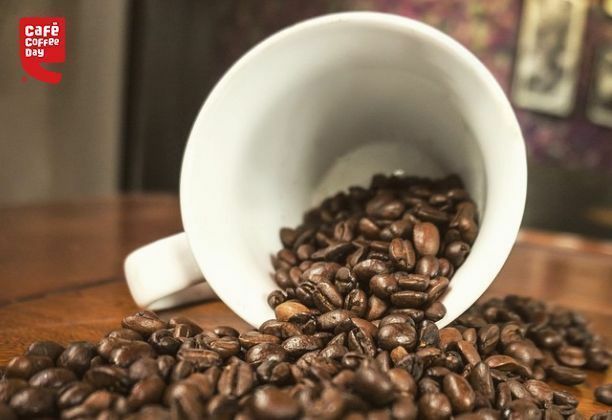 Apart from the popular coffee chain, CDEL’s holdings include Coffee Day Hotels and Resorts Pvt Ltd, Global Technology Ventures Ltd and Tanglin Developments Ltd. IPO Central takes a closer look at its prospectus to dig out more details. Through the IPO, CDEL plans to raise INR1,150 crore to fund its expansion plans. The IPO will only involve issue of fresh shares and will not have any offer for sale (OFS) from existing investors. This high-profile company has some impressive names in the list of existing investors. While VG Siddhartha-led promoter group holds 92.74% stake in the company, private equity firm KKR and Infosys co-founder Nandan Nilekani make it to the list of major shareholders with 3.43% and 1.77% equity stake respectively. Among other prominent names are Bennett Coleman & Company Limited (13,68,304 shares or 1.17%) and Rakesh Jhunjhunwala’s Rare Enterprises (275,856 shares or 0.24%). Nandan Nilekani and Rare Enterprises were allotted shares in the pre-IPO round in March 2015 and following a bonus issue, their effective acquisition cost turns out to be INR362.4 per share. Out of the INR1,150 crore, nearly INR632.8 crore will be used for repayment of loans while INR87.7 crore will be used for expansion of its retail network. Included in its expansion plans are 216 new outlets and 105 Coffee Day Xpress kiosks by FY 2016/17. Another INR97.3 crore will be invested in manufacturing and assembling of vending machines. CDEL has also earmarked INR60.6 crore for refurbishment of existing outlets and vending machines while setting-up of a new coffee roasting plant near its existing facility in Chikkamagaluru will involve INR41.9 crore. Following the investment, CDEL’s roasting capacity will double to 14,000 metric ton (MT) per annum. What makes Café Coffee Day IPO special? Unparalleled presence of the brand in virtually every major city. The company owns 46% share in the organized café outlets market. 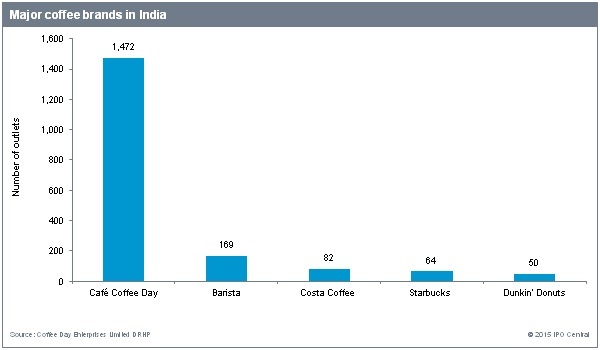 At the end of 2014, there were 1,472 Café Coffee Day outlets in more than 200 cities. This just beats down the combined strength of all its major competitors. Barista – its nearest competitor – has all of 169 outlets, although it plans to expand following the recent change in ownership. 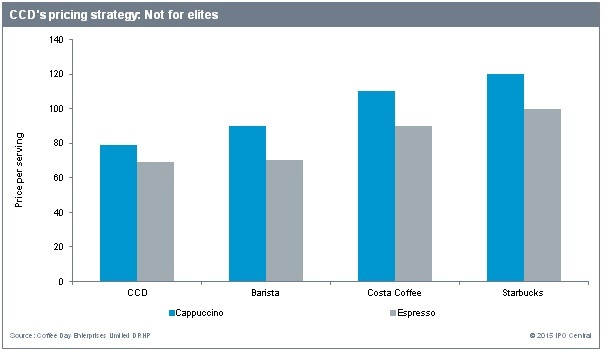 Starbucks – global leader in the trade – is actually a minion in the local market with just 64 outlets. Besides the geographical reach, Café Coffee Day has consciously kept its pricing on the lower side of the pricing spectrum. This is in line with Café Coffee Day’s projection as a brand for “young at heart”. This left-brain decision contrasts with Starbucks’ pricing which has gradually made the latter an aspirational brand. Notwithstanding the impressive list of investors and the geographical reach, CDEL’s financial performance is not so impressive. As seen below, the company has struggled with profitability, having ended three of the last five years in losses. Although figures for the full FY 2014/15 are not available, it is unlikely to be different since nine month losses stood at INR75.2 crore. Although not very accurate reflection of the retail business as these are consolidated figures, these are most relevant figures for investors as they will get shares of the holding company. The figures for Coffee Day Global Limited – which houses the retail business and contributes 49% to the parent’s top-line – are also in red with FY 2013/14 losses at INR9.4 crore. A back of the envelope calculation reveals Café Coffee Day lost around INR64,000 per outlet in FY 2013/14. Despite the losses, CDEL is an interesting play on the domestic consumption theme. Presence of the likes of KKR, Bennett Coleman & Company Limited, and Nandan Nilekani is reassuring about the pedigree of the company and its management. A lot will depend on how the IPO is priced and how much money is left on the table for small investors. In recent IPOs, bankers haven’t left money on the table and out of the seven listings so far this year, retail investors have made money only in Inox Wind and VRL Logistics. 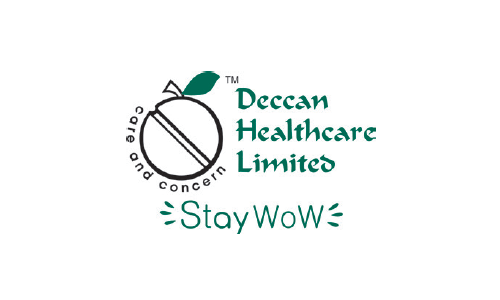 Deccan Healthcare IPO Review: Should you invest?